Q: What led you to conceive this book? A: Our friends would ask us many times, “why Italy?” and they deserved to know why we kept going back, over and over again, for twenty years. The relationships we built, and the secrets we discovered, were too big to keep to ourselves. This book really wrote itself, in a way, because the incredible experiences we encountered deserved to be shared. First we began to invite our friends along to see what we had found, and then realized that it had to be shared with others who might never be able to see it. Q: How many times did you go to Italy during the writing of the book? A: My wife was a flight attendant for Delta, giving us the ability to visit many times. I often accompanied her on long lay-overs in Venice, Milano, or Rome, and we’d spend several days delving into museums, or exploring out-of-the-way places. We made many friends, and returned often to visit them. Then, when it came time for our own holidays, we’d spend two weeks or even a month or two rambling around the countryside. We swapped our houses and cars with Italian families to live like Italians in small towns. All together, I’d say that we made perhaps seventy visits, totaling more than two years, and each one was a bit different. Of course, the idea of a book only gradually emerged. A: Oh, yes, and that’s a really tough question, because there are so many amazing sights. Venice is, I think, one of the most beautifully-unique cities on earth, Rome has a thousand stories from a rich past. Each hill town and castle has powerful attractions. We found ghost cities, and were stopped by the police. We slept in a castle, hiked to the top of Mount Vesuvius, and walked through a park filled with Medieval monsters. There are enough great stories to tell that I could fill two books. It was a challenge deciding what to leave out! The entire country is like a treasure chest full of art and history, beautiful architecture and landscapes, certainly good food and great wine, but the crowning feature has to be the Italian people themselves. They are warm and open, with a sense of hospitality that amazes us. We twice had virtual strangers invite us into their homes and put us in the master bedroom while they slept in other rooms on make-shift beds! How many Americans would think of doing that for their guests? Q: Were you changed by what you saw there? A: My wife and I went to Italy as typical tourists, but encountered an intimate and moving experience on our very first visit, when our friend George, a veteran of WWII, brought us to the 50th anniversary celebration of the Liberation. We had no idea he was a hero, or that many people in Italy share an abiding love for America, and gratitude for what he and others had done for them. They had survived the terror of Nazi and Fascist rule, when the populations of entire villages had been executed because of suspected sympathies for Partisans. When the Americans had arrived, it was a form of re-birth. They never forgot. That realization changed me, certainly, and I hope it changes the reader, too. Romancing Through Italy almost wrote itself, because everything in it is true. The events were so memorable and varied, that it was like a throw-back to my reporter days. “Just the facts, Ma’am.” We spent years, in total, visited hundreds of places, from little hamlets to big cities, castles, churches, and farms. We met hundreds of people, and had dinners in dozens of private homes, getting to know their families, how they cooked, the things they talked about and the lifestyles they enjoyed. Italy was absorbing. All I had to do was recall the details. Photos helped. Getting stopped by the military police, of course, we couldn’t take photos then, but most of the places we went, we still have photos of. Those of the memorial services with the veterans, now almost all gone, are the ones I treasure the most. I grew up in a small central Florida town, and because there wasn’t a lot of entertainment available, I began reading at a very young age, and devoured books by the hundreds. I would read perhaps fifty over the course of a summer, and another hundred or so on top of my school work. I would read everything in an entire genre at my school library, and then go on to a new interest. Animal stories, science fiction, eventually and history books and stories of the sailing ships and explorations. I guess because I read so much, it seemed natural to write, and I ended up on the school paper, and then was hired as a news reporter for a daily. I made $60 a week to start. I was 18 when my editor told me that a story I wrote was the best human-interest feature he had ever seen in a newspaper. He inspired me to keep after it. The realities of the publishing industry today are so different than those of ten or twenty years ago. Given the volume of writing being generated, and the relatively small number of agents and major publishing houses, it’s almost like putting the camel through the eye of the needle. I knew there had to be a better way to find an audience than chasing after agents, and then hoping they could chase down a publisher. Happily, I also began working with Plumeria Publishing, and they have helped me maximize my work, and get it to market for bookstores and libraries. I enjoy books from hundreds, and it’s difficult to name only a few, but everyone from Goethe to Poul Anderson, Michener to Frances Mayes. I enjoyed Kerouac, and Heinlein, and Hemingway. I read different kinds of books at different times in my life, and there were only a few that disappointed me. My bookshelves are burgeoning with great authors. The rewards are many, but the best is being able to share a deeper perspective, to open reader’s minds to new possibilities, and offer insights that they would not otherwise encounter. Italy, for example, is a desired destination. Millions go, and millions more just dream about it. Yet many of those who visit are swept through on brief whirlwind tours, and never have the opportunity that we had to really immerse ourselves in the culture, and come to know the people, and what makes the nation tick. I am really happy that this project gave me the chance to share the things we learned, and hopefully help others get more from their real or virtual visits. That is one challenge that I leave to the professionals. I have been blessed to be able to work with Curchy Design, a local firm near my home, and get really good results. My wife has been a major contributor in that regard, working with the artist to get a really stand-out cover. She’s very talented as well, and deserves credit. I enjoy traveling, and do it both for research and enjoyment. I have accelerated my pace in the last three to four years, and have been committing to months at a time, both in Europe and the US. I’ve done two long western trips recently, and will soon do a cross-country trip that will include several book-signings. I am very social, and like to meet new people and hear their stories. Many times I find inspiration in the people and things I encounter. Then I find another writing project on my already-full plate! My next project is pretty ambitious, a historical novel that covers the entire human history of Florida. It has required an immense amount of research, and I actually began writing the first draft chapters 20 years ago. It’s a big story that deserves to be told, and Michener never got a chance to write it, unfortunately. Too much of history is hidden in dry text-books. My goal is to bring it to life with enjoyable characters and weave the threads of multiple families together. Native Americans, Spanish, French, English, Greeks, Africans, Cubans, Madeirans, they each contributed to the culture, and they each have stories to share. I expect to have it done sometime next year, and I hope it will be well-received. 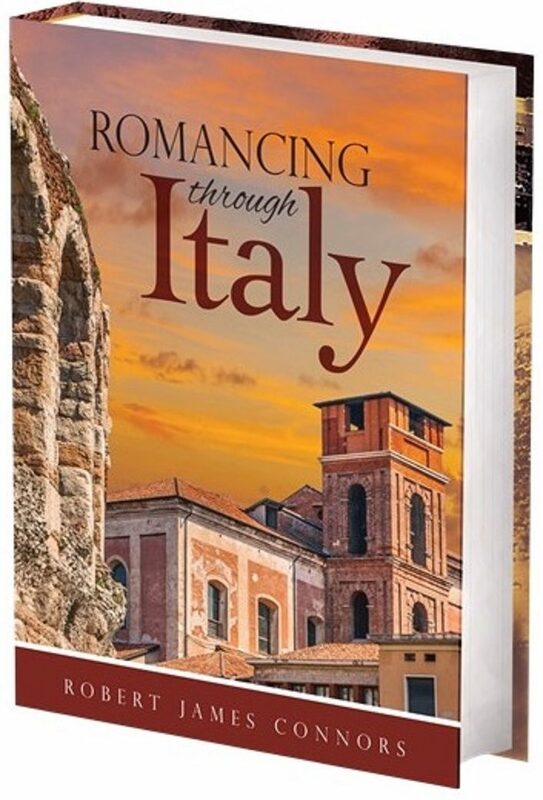 My experience with Romancing Through Italy and Plumeria Publishing has me very encouraged.